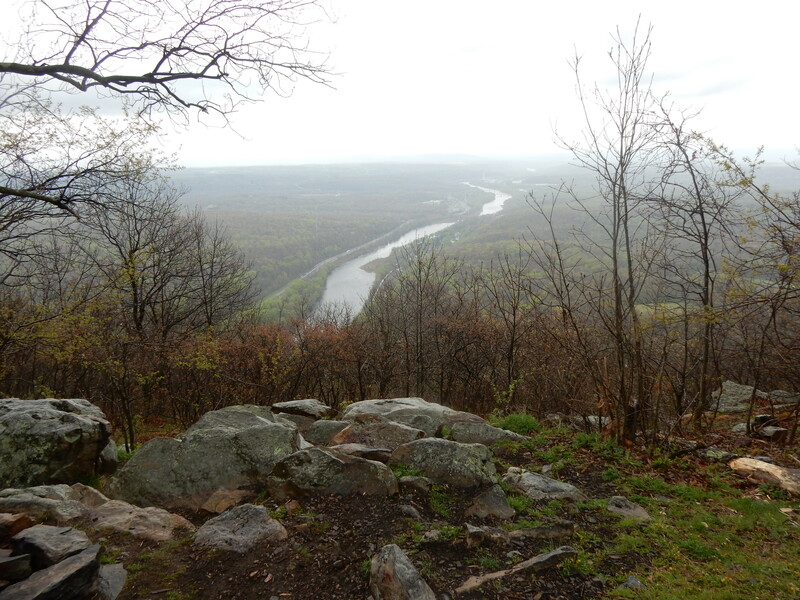 Having two cars, once again, Maple and I decided to complete our trek across Pennsylvania this weekend by backpacking north from Wind Gap, tenting at Kirkridge Shelter, and then crossing the Delaware Water Gap into New Jersey. 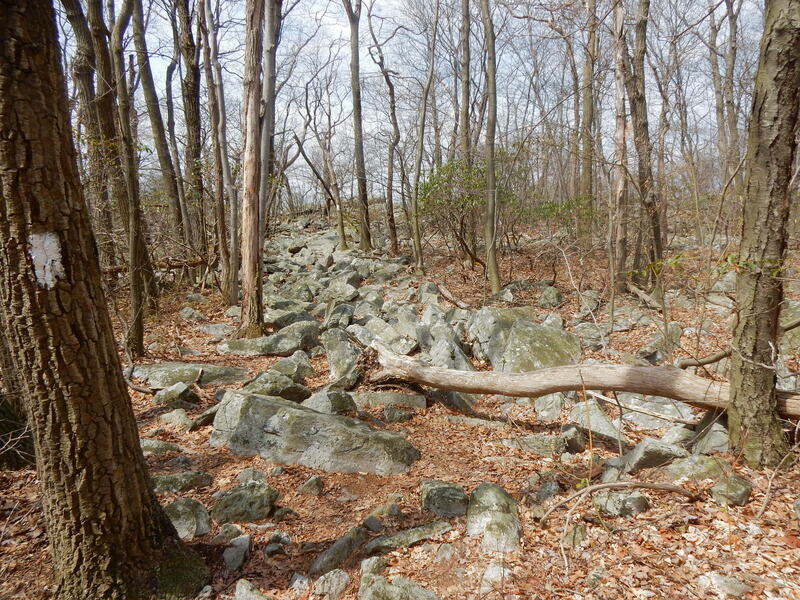 After climbing up the Kittatinny Mountain, which begins north-easterly of Wind Gap, we found ourselves back on the rock-strewn path that is so typical of the AT in Pennsylvania. 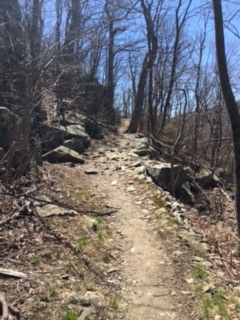 This rocky path is without any distinctive landmark for seven miles, until one reaches Wolf Rocks, which is a ridge-line pile of boulders, across the top of which the AT stretches. 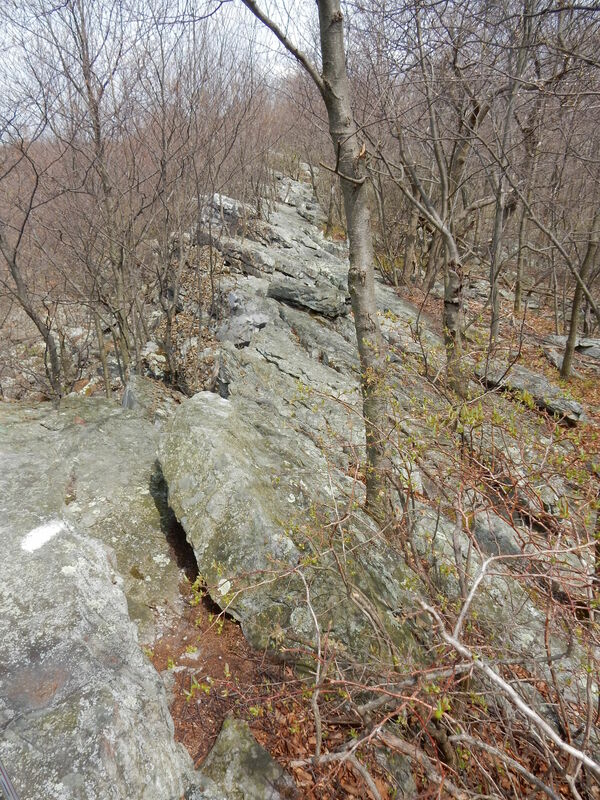 This section is nearly as difficult and dangerous to cross as was the Knife Edge, which the AT traverses on its way toward Lehigh Gap. Between Wolf Rocks and Route 191 the trail is much improved, both smoother and wider. After crossing 191, where there is roadside parking, it is only half a mile to Kirkridge Shelter. Thus, although the shelter was deserted when Maple and I arrived, we figured we’d be having company, and even though rain was in the forecast, we decided to raise our tent outside, so we’d have privacy. Sure enough, it wasn’t long before a group of Boy Scouts arrived. They were so polite and gracious that we wouldn’t have minded if they had stayed, but there is very little tent space at Kirkridge Shelter, and after one of the leaders discovered the vacant lot of grass just north of the shelter, they packed up and set up their camp at this preferred location. We also had the pleasure of meeting two-time thru-hiker Nuthatch, who was on a day-hike with her canine companion, Mahoosuc, and decided to briefly stop by the shelter for the sake of memories. 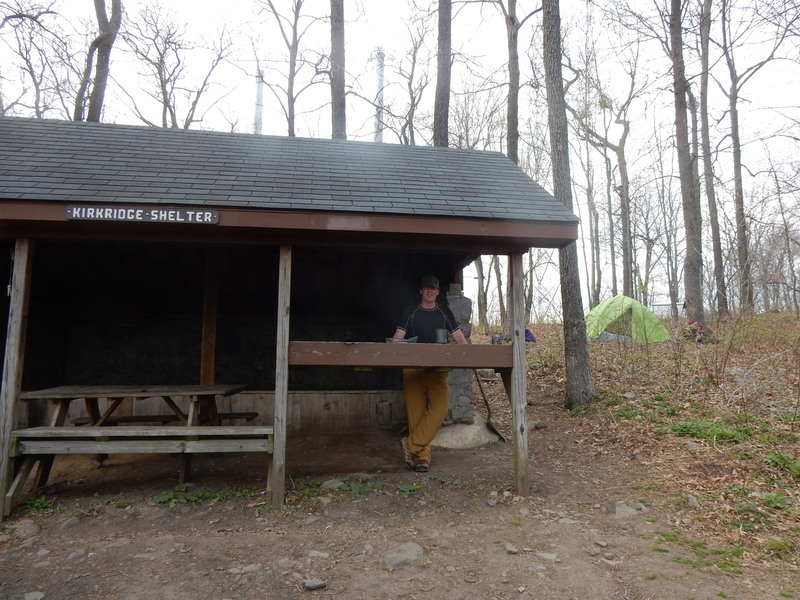 Ultimately, as things turned out, Maple and I had the shelter to ourselves throughout the night. 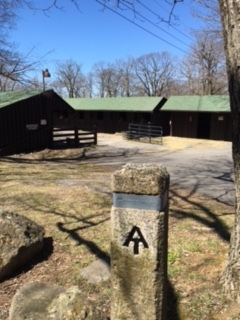 There is water seasonally at Kirkridge Shelter, potable water from a spigot, but the source is turned off during winter. Although it is early Spring, with temperatures now in the 70s, I decided it were best not to take chances, and so I packed 6 liters from Wind Gap. It was a good thing I did! 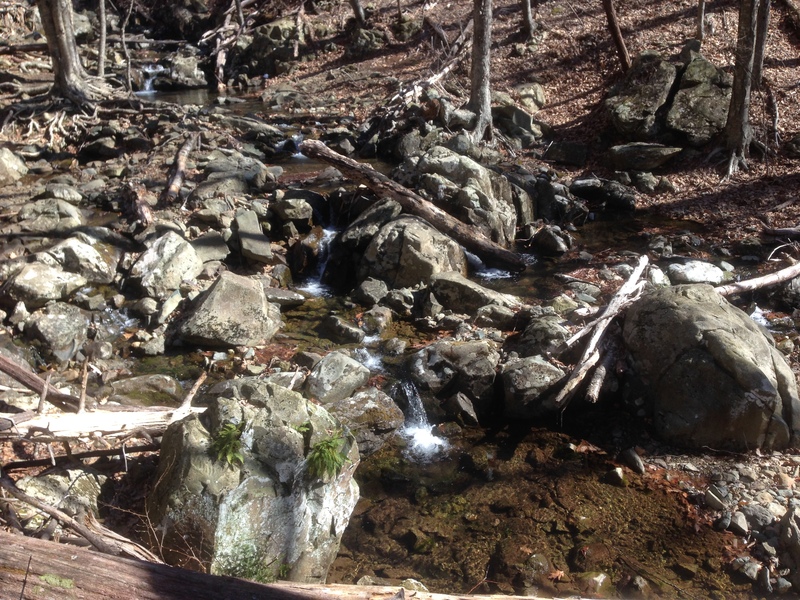 There is still no water between Wind Gap and Caledonia Creek, at the bottom of Mount Minsi. It rained during the night and nearly all morning. Fortunately, the weather cooled considerably, so in the morning Maple and I were not uncomfortable hiking in our rain jackets. We were back on the rock-strewn path until we reached Totts Gap, two miles north-east of the shelter. 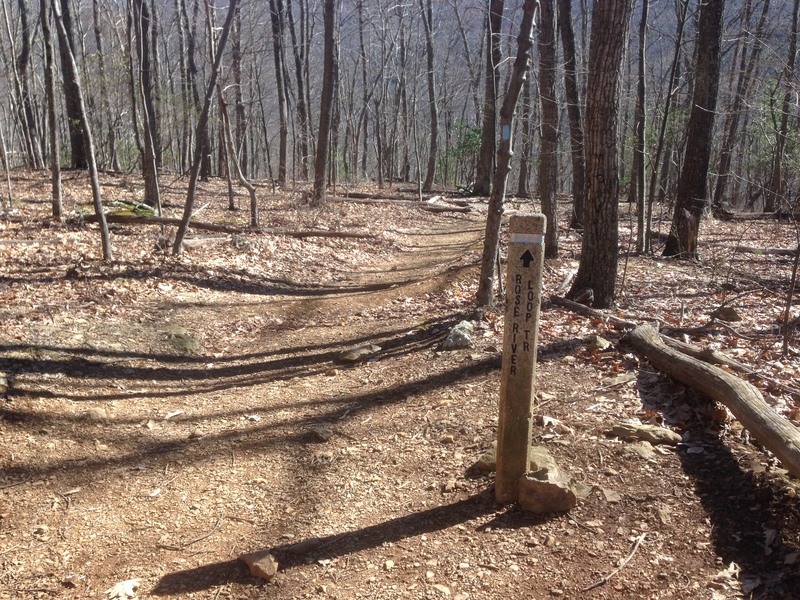 Between there and Mount Minsi, the AT follows a service road that makes for easy hiking. The descent from Mount Minsi is steep, and one has to use large rocks as stepping stones. In the rain, these were slick, and though I tried to be as careful as I could, making use of my trekking poles for balance, I nevertheless slipped and came down on my hip. It was like slipping on ice and falling on concrete. I’m not sure whether my backpack made my fall harder or lessened the impact, but I soon was on my feet again, little worse for the wear. The occasional fall is just part of the price one pays for the pleasure of backpacking. 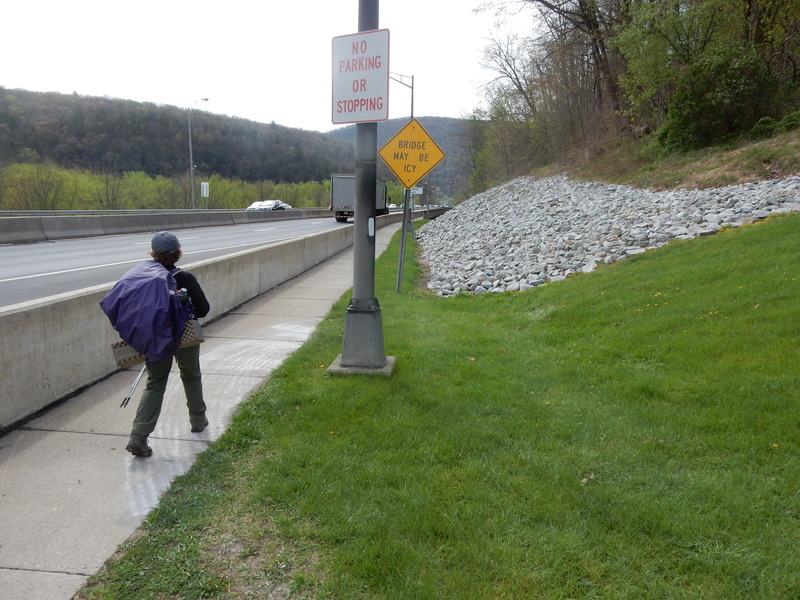 By the time we reached the community of Delaware Water Gap, on the western side of the bridge crossing the Delaware River, the rain had stopped and the sky was rapidly clearing. 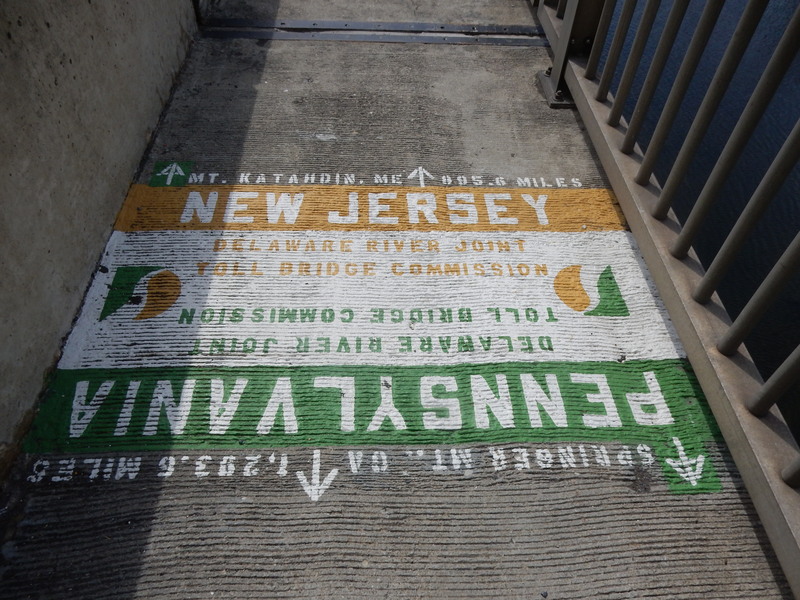 We had another mile to go before we, finally, crossed the bridge and arrived at the parking lot at Dunnfield Creek in New Jersey. Springtime! As the weather warms up, so does our desire to hit the trail. 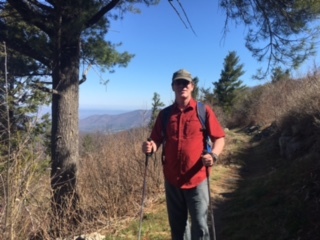 Birch and I decided to continue our southward journey on the Appalachian Trail. We dropped off our car at Fishers Gap and then waited expectantly at the side of Skyline Drive, hoping for a ride to mile 38. The first car stopped! The first few miles of the trail wind upwards. It is a relatively long but gradual ascent that offers several good views. 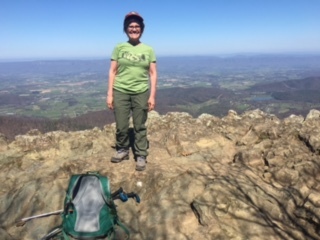 This area, Stony Man Mountain, is the highest elevation for the AT in Shenandoah National Park (3837 ft.) We passed a boy scout group learning to climb and volunteers doing trail maintenance (thank you!). Otherwise, it wasn’t busy. Shenandoah is still in early Spring. There are sprigs of green grass here and there but the trees are still bare, unlike the elevations below. This means that views can be had in many places along the trail. Still, I was a little surprised that there seems to be little progress towards tree cover here. As we passed Skyland North Entrance, it seemed that things leveled out considerably. Eventually we passed the South Entrance and saw the horse stable. (I had no idea that it was there.) The AT south of the horse trail is not well marked with blazes, but it is a well defined trail. A mother bear and her cubs crossed the trail just ahead of us. Finally, a bear! It wasn’t long before we reached Fishers Gap. This area was full of tourists all taking advantage of the free park entrance offered in celebration of the national parks. At the time, a wild fire had already started further south in the park. We were clueless. Let’s hope the fire is contained soon. This is a beautiful park, and it would be a shame for fire to mar it. Although a little anxious about the weather this weekend, since a chance of rain and/or snow along with high winds was predicted, Karen and I decided it was time for us to get back onto the Appalachian Trail and complete our trek through Pennsylvania. We were to begin at Wind Gap, PA, and finish across the Delaware Water Gap, in NJ. Since it now takes us over four hours to arrive at our commencement point and we wanted to get on the trail early in the morning, we spent the night in a motel. As always, we brought two cars, one to be waiting for us at our hiking destination, and one to drop us off at our beginning point. Well, we were within 100 feet of the AT parking lot in NJ, where we were to drop off our first vehicle, when our two cars were involved in a collision. Both required to be towed away from the scene. Our backpacking plans were shot. Ultimately we got a rental car and made our way back home, but we were both in the dumps. Our spirits needed reviving, so on Sunday we drove out (in our rental) to Shenandoah National Park. Because Karen’s wrist was swollen and sore, disabling her from putting much pressure on one of her trekking poles, we decided upon a comparatively gentle hike, the Rose River Loop, a four-and-a-half-mile walk. We’d hiked it before (and blogged about it in August 2014). Unfortunately, winter’s peculiar beauty, particularly when all is wrapped in snow, is past and spring is yet struggling to manifest itself on the heights of Shenandoah. There were few leaves on the trees, and all was brown and grey, with little touches of green here and there. But we were able to get good views of the river through the branches, and a few birds had already returned. For the most part, it was just good to be outdoors. We needed to get some cool air into our lungs and work up a little sweat in a climb, but mostly we just needed to be surrounded by nature. At one point, where the trail starts to ascend, we sat ourselves down on the dirt, took out our little stove, and made ourselves some coffee. What could be better than to break from a hike, kick back with a mug of steaming coffee, and take in the scenes and sounds of nature all around? It was a restorative experience.